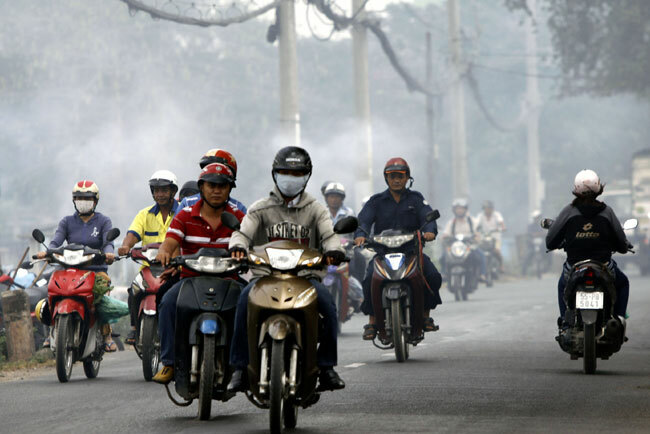 HA NOI (VNS) — Air pollution in Ha Noi and HCM City has risen to alarming levels due to waste, dust and noise pollution, and has affected the health of area residents. In a report issued last month by the Environment Department of the Ministry of Transport, dust pollution in Ha Noi exceeded the permitted levels, possibly rising to double the standard levels. Further, pollution levels are increasing due to the endless streams of traffic and ongoing construction projects. According to statistics from the Viet Nam Environment Administration's Environmental Monitoring Centre, at many intersections, such as Kim Lien, Giai Phong, Ha Dong, Nguyen Xien roads, Phung Hung, De La Thanh streets and crowded residential areas, dust levels are often 5 to 7 times higher than permitted levels. A recent study shows that 72 per cent of household residents in Ha Noi report suffering diseases related to respiration, with Hoang Mai District residents suffering the highest levels, at 91.4 per cent, while the lowest level was recorded in Tay Ho District, at 55 per cent. Further, many people suffer from dust and smoke on sunny days and mud when there is rain. Of note, on Yen Nghia Road in Ha Dong district there are three unfinished construction projects and dust covers trees, grass, as well as the residents' houses along the road. "All doors and windows are closed day and night, I even have to hang the wash on a line in the house to dry," said Nguyen Hien Mai, a local resident. "Unfinished construction has seriously affected the lives of all people here. Children are not allowed to play outside their houses," she added. Similarly, air pollution levels on some roads, such as Truong Chinh, Highway No 1, Mien Dong, Mien Tay bus stations, or areas near industrial zones in HCM City have worsened. Additionally, the enormous number of vehicles operating during peak hours has caused a large amount of dust and smoke, contributing to increasing air pollution levels. Also, noise pollution is attributed to traffic, factories, and constructions sites, which affects the quality of the local environment. According to the city's Environmental Protection Department, 89 per cent of air samples checked in HCM City do not meet current safety criteria. Environmental experts state that an increased use of public transportation, instead of personal vehicles, would help lessen the crisis.